I awoke at 1 a.m. with too much on my mind. So, I reached over to my bedside table and picked up my iPhone to sort through e-mail and read the news of the night via Twitter. The devastation of the Japanese earthquake and tsunami were just hitting the media, and I found myself up until 2:30 watching videos and reading blogs and updates. I was half a world away but watching millions of lives changing and ending before my eyes. What powerful emotions wash over you when you feel simultaneously saddened and fortunate. So it was painfully ironic that I stepped outside this morning with my camera to capture the beauty of water. Ice had created amazing patterns on our car overnight. H20 as a tsunami wreaks devastation, while frozen hydrogen and oxygen molecules merge into artistic creations that amaze in their perfection and delicate detail. Like this direction, looking good. Thanks for your note Lynn. I’m still drawn to CNN on a regular basis for updates; such a horrific tragedy only seems to worsen. All is well here. The spring races always remind me of our times together…perhaps we will cross paths soon? You have described with unerring accuracy the very essence of nature. That’s exactly what I felt myself when I first heard the news: everyday I marvel at the beauty of this world, and that very same thing can end thousand of lives in the blink of an eye. The kind of paradox one has to learn to live with, however we can. I love this shot. 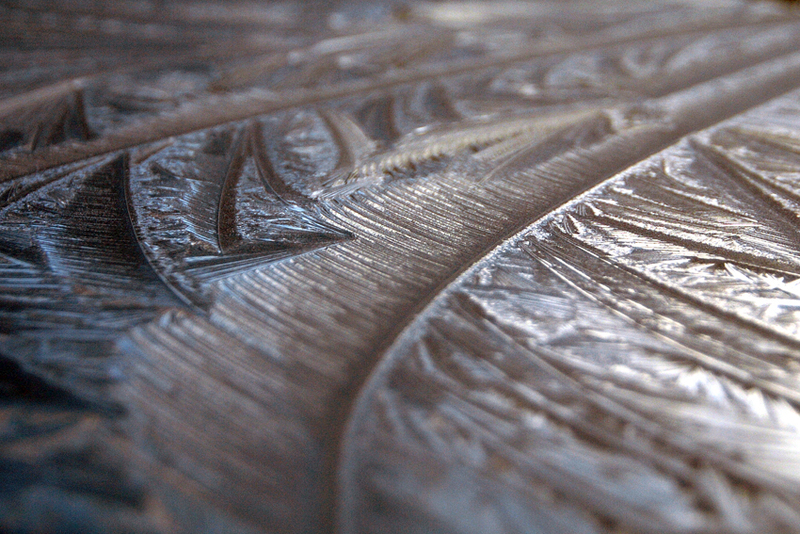 I didn’t understand what it was at first, since I’d never seen ice create that kind of pattern.